Eanes - Jacobson Building at 113 East 3rd Street built in 1911. Two story structure with rectangular plan and truncated corner entry. An example of vernacular Victorian commercial architecture with elements of the Queen Ann style in the pediment with knob and carved stone panel and in the rusticated stone of the architraves. 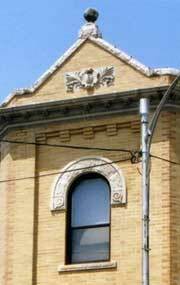 Simple cornice is executed in terra cotta. Different brick color is used to emphasize corner detailing.